Ever considered buying a clay pigeon trap for personal use, perhaps jointly with a couple of pals? If so, there’s probably never been a better time to make that a reality. Only a few years ago this would mean purchasing a manual trap, which most big clubs relied upon when I first began shooting clays. I would like to add my comments about Acorn clay traps. I purchased a second hand Acorn trap a few years ago which has given good service. Recently it developed a problem in so far as it was breaking clays a little too regally. I telephoned Acorn who suggested that it my be the rubbing strip on the launch plate, after a period of time they become hard and tend to damage the clay before it is launched. Acorn supplied me with a new strip but unfortunately in fitting it something got damaged with the mechanism. Other telephone call to Mike who was very helpful and suggested that I return the trap for overhaul. This I did and at the same time I felt that an upgrade to the trolley would be useful. My experience with dealing with Acorn has been excellent, it’s nice to have a British Company which is of the old school who not only look after customers but can still service and maintain products long out of production. I would recommend Acorn to anyone who is thinking of buying a trap for private or club use. 10years ago my clay club bought one of your Silhouette Traps which is still doing sterling service for us. We were also given a new 90ah leisure battery which has just expired. I thought I would check the electrical spec of the motor & work out what ah battery is really needed for our typical use - there is no technical spec visible in the manual or on your website ?? The trap is stored elsewhere inhibiting actual measurement so can you help me with a typical current & duration for loading each clay or any other battery sizing guidance you can offer please ?? The trap is an excellent piece of kit that has given us most reliable service. I have provided a socket for the relay, where the contact rating is clearly stressed by this application, so that replacement is a quick & easy field operation !! I’m so pleased I stepped up the range to the Acorn AutoClay 320 and even more so that at the last minute I decided to have it mounted on an ATV trailer. Didn’t really fancy pushing it up the field on a hand trolly! Assembled it is a really solid piece of kit, and the smooth ride from the big wheels means it can easily be moved around with a loaded carousel to set up hundreds of different shooting angles with ease. With a cup of tea and at a leisurely pace it took me about 45 minutes start to finish to put it together including fitting the spring. 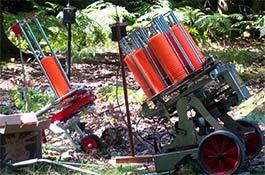 The first trial was to set the trap up so it fired clays over a hedge and trees into the valley behind. Distance I would say 60metres to clear the trees elevation needed about 30 to 40ft. No problem! I then tested the wireless control by walking around into the valley and then underneath the hill with the hedge and trees between me and the trap I pressed the button not being able to see the machine at all! Over the clays came perfect just like game flying over! I have owned an acorn trap for about 5 years now and it gives excellent performance, and should I need assistance, the the guys at acorn are second to none, for advise on repairing or supplying spare parts. One problem I have encountered recently. is that since my trap is fitted into a small trailer, it has to live outside, but has a bespoke cover over it to keep the worst of the weather off it. I got it out a few days ago as some of my friends fancied doing some clay shooting and found that although it was working, the up/down and side to side movement was very "jerky" anyway to cut a long story short the problem was dampness in the receiver, I heated the receiver up on top of our Aga for about half an hour to remove any dampness and re-tested it, to which everything was back to normal. Therefore if you also store your machine outside like I have to, then do as i will be doing in the future, and remove the transmitter and receiver boxes and store them inside in a warm environment. I am treasurer of a small shooting club, Glenorchy Gun Club, Dalmally, Argyll. We bought an Autoclay 300 about 5 years ago and have used it constantly since then at least twice per month. This machine has performed admirably without fault until a short time ago when I inadvertantly connected it to the wrong battery terminals causing a fault in the system whereby it failed to automatically fire the clays. A quick telephone call to Acorn Traps, resulted in some sound advice being given and the fault was rectified by means of bridging 2 posts in the circuit board. Our trap is working again good as new. A great machine and a great Company to give such good advice on the strength of a telephone call. Thanks again, from a much relieved treasurer. I bought an Acorn Silhouette back in 2005. It is still working as good as the day I bought it. These traps are built to last and give years of trouble free service. Don't be fooled by cheaper traps on the market, they are not a patch on Acorn traps. After 7 years I lost my remote key fob and phoned up Acorn who were only too pleased to help and give brilliant service. You don't get that from others suppliers I bet ! I managed to get this afternoon off work so I gave the trap (RF90) a try. 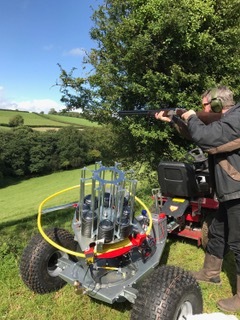 We are both well impressed with it and we soon ran out of clays and cartridges :) Thanks very much and if I need anything else or another one I will get in touch with you.